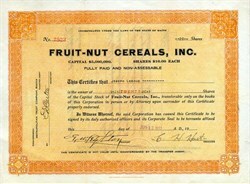 Beautiful certificate from the Fruit - Nut Cereals, Inc. issued in 1922. This historic document was printed by the John A. Lowell Banknote Company and has an ornate border around it with the company name on the top center. This item has the signatures of the Company’s President, G. W. Leighton and Treasurer, C. H. Hart and is over 87 years old. "Each Time We Advertise Our Sales Jump"
Public Reacts Promptly to Advertising of Fruit Nut Cereals, Inc.
Fruit Nut Cereal is a comparatively new product and its manufacturers have had some interesting advertising experiences. Every time they advertise, they find that sales take a sudden leap. Their first advertising campaign trebled sales and caused them to build a new factory; and the second filled the new plant to capacity the week they started advertising. The following table represents the figures of the drive started at the completion of the new plant. In the first column is given the monthly expenditures for advertising from September, 1921, to August, 1922, and in the second column the volume of business expressed in relative units, which will serve for the present purpose almost as well as if the actual dollars were stated. The volume of business in September, 1921, during which month there was no advertising and which would represent an average month before the advertising drive, is taken at 100 units, and the value of the business in subsequent months is expressed proportionately. January February March .. April . .. May ... June ... July .... August . A very cursory glance over the figures shows how the volume has matched up with the advertising. Prior to October, 1921, no advertising had been done for several months. In October a newspaper drive started with an expenditure of $13,140. Immediately sales about doubled. As the drive tapered off, sales likewise fell off. Commencing with 1922, advertising expenditures increased and sales again climbed, until we find, by the middle of the year, with a moderate advertising expenditure, that sales are approximately up to the point they were driven by the heavy campaign in October, 1921; that is, the year's advertising work has presumably brought the sales up to a new normal level nearly twice that at which it began. Variations in the rates between advertising and sales may be accounted for by seasonal conditions. To understand these results a little better we must go back and tell more about the advertising itself. In Printers' Ink of December 2, 1920, an article entitled "Breaking into the Market through the Side Door" described how this concern, entering the breakfast food market—a highly advertised field in which it would normally be almost impossible to become established without advertising—cleverly got its initial distribution by working through the doctors and getting them to advocate Fruit-Nut Cereal as a health food. Using this side-door entrance, the company established connections with a considerable number of grocers in New England, where its work has been concentrated—usually the leading dealer in the town. Then came the first experience with advertising. About $5,000 was invested in newspapers, small advertisements being run twice a week in Boston and several other cities^ the campaign continuing over a period of several weeks. The small plant was immediately overwhelmed with business; volume just about trebled. Then the new plant was built. When they went into it, the business utilized only about half its capacity. So the owners commenced the new advertising campaign on which figures have been quoted— this time a more pretentious drive. Within a week the plant was working to the limit; most of the time since it has been a hard race to keep up with orders; and, as shown, the advertising has had the effect of raising the natural level of business to about double the volume attained before the advertising drive was started. Mere space alone has not accomplished this. A great deal of the result is no doubt creditable to the unusual and aggressive type of advertising used. The angle taken, more particularly in the large- space , advertisements which opened the drive, was that the new plant, though much larger than the old, was overloaded with orders because of the popular demand. And when we made those plans last winter, we felt ample allowance had been made for the future. Our good friends, the doctors of New England, found that besides being palatable,- appetizing and delicious, Fruit- Nut Cereal had beneficial qualities lacking in other breakfast foods, and they recommended it. Thousands of small boys and girls here in New England tasted Fruit-Nut Cereal once—and, like Oliver Twist, came back for more. Many an invalid who could not digest ordinary cereals found that Fruit-Nut was easily assimilated. And all this aside from the normal everyday run of grown-ups who tasted and liked this delicious breakfast dish. And doctors, children, invalids and other folks throughout New England, all came to know Fruit-Nut Cereal, liked it and wanted it, all at one and the same time. So the demand which we figured on for 1925 developed in 1921. All of which leads up to our admission at the top of this page that "We admit we were mistaken when we built our new factory." Following the same theme another advertisement requests, "Don't blame the grocer—it's our fault—if you can't always get Fruit-Nut Cereal." Such advertising would naturally have an effect on the grocers, too, stronger than ordinary statements; and this, together with a certain amount of missionary work, made them come through and do their part. The campaign covered different sections of New England, starting with Boston and going to Worcester, Providence, Springfield, and Connecticut. In each case the chain stores started ordering as soon as the advertising was published. Many of the grocers co-operated in the campaign by using newspaper electros the company had prepared. In each drive, after a number' of the large-sized advertisements had been published, space was gradually reduced to allow the campaign to taper off gradually. The purpose of this advertising was a bit different from ordinary food advertising. Consequently its tactics were different. Its purpose accomplished, the future advertising policy of the company will no doubt be the use of regular, consistent space in smaller size. As a matter, of fact, since the main drive ended, small space in the cities mentioned is being used as follow-up, to serve as a reminder to those who read the previous advertising and to keep the name alive with both the public and the dealer. As the drive tapered off into the smaller sizes, the nature of the copy changed somewhat, dealing then with the specific qualities of Fruit-Nut Cereal itself. These, indeed, had not been forgotten in the large advertisements, but they were subordinated to the big idea of an over-rushed factory. 'The health appeal said G. W. Leighton, president of the company, "served its purpose in enabling us to get initial distribution. The people who buy on that appeal, however, represent only a portion of the market. We want to catch the healthy as well as the sick, and felt if we continued to concentrate on the original idea, people would come to look upon our product as a food good only for those with dietary ailments—as a medicine rather than a breakfast food. So we have broadened our arguments to interest both, placing that of palat- ability first. This after all is the best argument for normal people; for while they want healthful foods, they want those that are tasteful above all."